There are thousands of DJs out there - how do you set yourself apart? Besides improving your technique and developing your own sound, getting your name (and face) in front of people is crucial. Used to be that you'd need to hand out flyers, print out posters, but nowadays growing an engaged following on platforms like Instagram is key component of your personal brand. 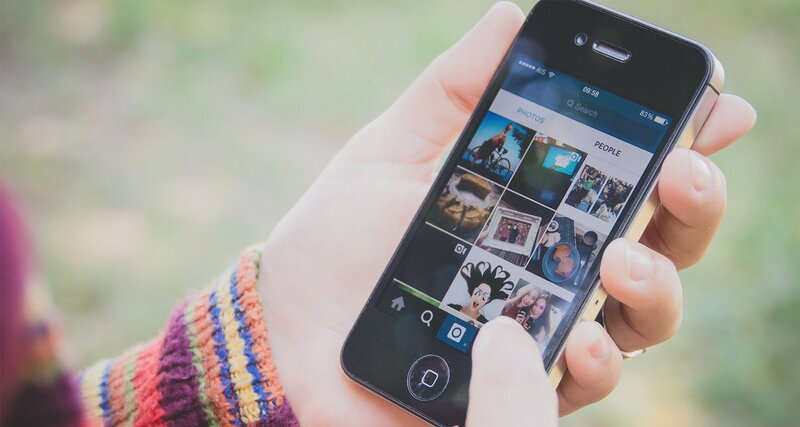 So here are our five tips for cultivating an engaged following on Instagram. The best way to grow your following on Instagram is to interact with users more than you post photos. This may sound counterintuitive, but unless you're a celebrity (think Tiesto, Carl Cox, Hardwell) people don't have a reason to follow you just yet. Get fans to look at your profile by liking and commenting on their posts, but be genuine (avoid spammy "Cool profile, follow me and I'll follow you!" comments). Don't forget to reply to their comments on your photos later on, too. This is how you build a community of fans and serve your audience - it's better to have a few hundred engaged followers than a couple of thousand who never interact with you. Never resort to services that let you buy likes or followers! Social savvy tip: You don't always have to post something right away, sometimes you'll want to spend a bit of time picking the best photo to appear on your profile. take a photo either from your daily life (food, travel, hobbies), work / school, or DJing (practice sessions, gigs, your bedroom studio, and so on). You're bound to encounter something worthy of your profile in at least three of these areas. Just use your phone's camera to keep taking photos, and then pick one out that you're happy with later on. In time, you'll learn which photos resonate more with your audience (and which ones you'd like to see, as well), so just keep at it and don't be afraid to post, especially if you're just starting out. Doing beats overthinking. The use of hashtags continues to evolve: it used to be a way to index tweets on Twitter, and today people use it for various reasons, most notably for humour. You don't need to be funny to use hashtags effectively: just add in DJ-related tags to your Instagram posts so they get indexed along with other similar content. That way, your photos get seen by users who otherwise wouldn't know who you are when they browse for photos according to hashtags. Of course, use it only when what you're posting is relevant to DJing - if you're taking a photo of your bubble and squeak breakfast, you may want to skip this (use a food-related hashtag in this instance). Some hashtags to use: #dj #djlife #djing #djproducer. Music genres that get a lot of attention include: #EDM #deephouse #techno. DJ brands and models also work well, such as: #pioneerdj #nativeinstruments #seratodj #virtualdj, for instance. Use Instagram's tag search function to see which DJ-related hashtags have an active following, and pick accordingly. Social savvy tip: Instead of filling your description with a ton of hashtags that would make it look spammy, add a comment right after you post your photo and put all the hashtags there. It'll function the same way as a hashtag in the description, and when people start commenting on your photo it'll get tucked under them. 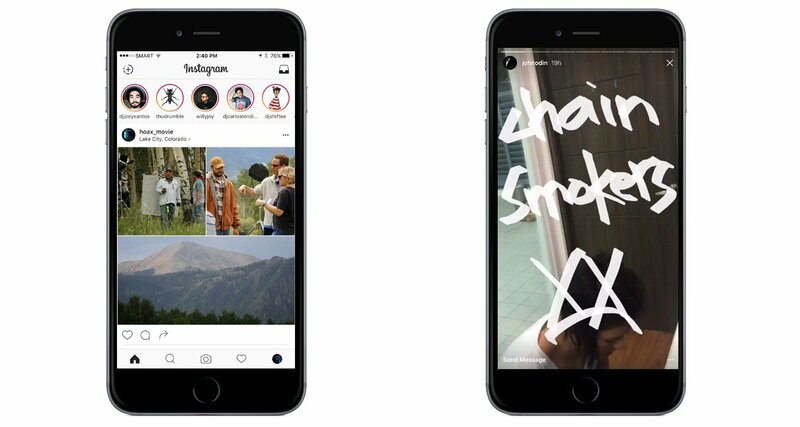 Instagram just rolled out a new feature called Instagram Stories. It lets you take photos or 10-second videos that you can add filters to and draw on, which disappear after 24 hours. It's not as "permanent" as what you'd post on your main Instagram profile, and as a result you can post more casual / mundane stuff, as opposed to more polished photos. Think of it as Snapchat for Instagram, with the advantage being you're consolidating two types of content into one platform for your audience. Social savvy tip: Check out the Stories of users that you follow, and reply to their stories by sending them messages within the feature. This is a newer, different way to engage with Instagram users apart from liking and commenting on their photos. Once you've sent a message, it goes to that user's inbox and you can get a chat thread started for a more personal interaction. When someone replies to your story, always make it a point to send them a message back. 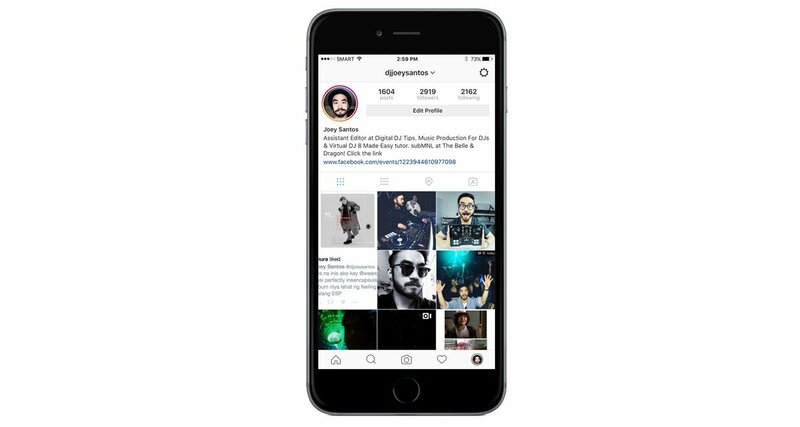 Some DJs use Instagram as a platform to incessantly promote their gigs, and what happens is their profile begins to look like a rave flyer collection. Over-promoting your gigs is one of the fastest ways to get fans to unfollow you. Here's how I check if I'm over-promoting: if the first nine photos on my Instagram profile are all gig posters, I'm probably being too noisy about my upcoming show. Remember, not everyone who follows you lives in the same town / city / country / region as you. Just don't overdo it - it's OK to post your show posters, but break them up by putting other content in between your promo material. Social savvy tip: Always use the link section in your Instagram bio to promote. Do this by adding the event page URL of an upcoming gig. Whenever you post a flyer for an upcoming gig, add the line "Link in my bio" in the photo description as a call to action to get people to click on that URL. You can also use this if you've got a new mixtape or production that you want people to check out, because Instagram doesn't allow links in photo descriptions or comments. Instagram also lets you shoot up to 60 seconds of video. Get on cam and talk about music you've been listening to, share a quick clip of you practising, or post a video of your crowd during a gig. It's one way to add variety to your profile and break up the types of content that you post, especially if you've been focussed on just adding photos. Social savvy tip: If 60-second videos are too much for you, you can try using Boomerang, which is an app external to Instagram. It lets you create a short stop-motion video loop that plays forward and in reverse. It looks like a GIF, and is a fun way to share bite-sized action when a normal photo or longer video just won't do. Again, a smart way to add variety to your Instagram profile and to keep fans coming back to check it out. You've probably heard some DJs complain about how "kids these days" focus more on social media marketing instead of upping their DJ skills. 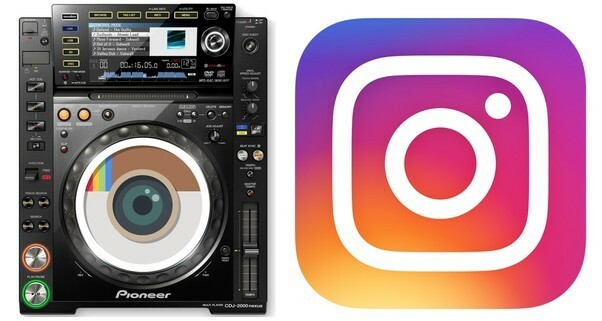 While we do agree that working on your DJing is more important than working on an Instagram about your DJing (after all, you can't just "gram" your way through a DJ set...), it's still a key piece of the modern digital DJ puzzle. Here's an internet marketer truth that I swear by: People won't know who and how good you are if you don't tell them, so don't afraid to speak up. 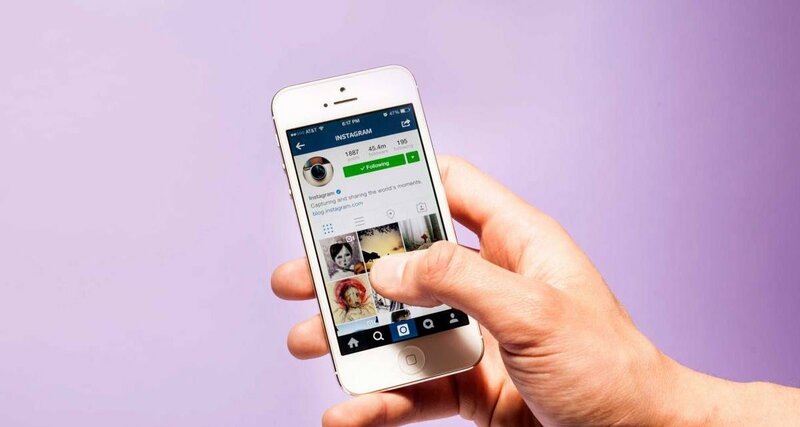 Spend a little time each day working on your Instagram game. Always remember that it's about engaging and growing a community of fans, and to do that you've got to serve your audience first. While having a high follower count can stroke your ego some, it's never the end goal of being active on social media.